Where is the missing Google Cardboard Photo Sharing App? Everyone seems to be talking about VR these days. For Christmas, my brother gave me a Google Cardboard. It took no time for me to see why VR is all the rage and is set to take off in 2016. Simply put: Google Cardboard = Amazing. While the Cardboard isn’t perfect – I can’t wear it too long without getting a bit of a headache and the picture is blurry – the experience is amazing. 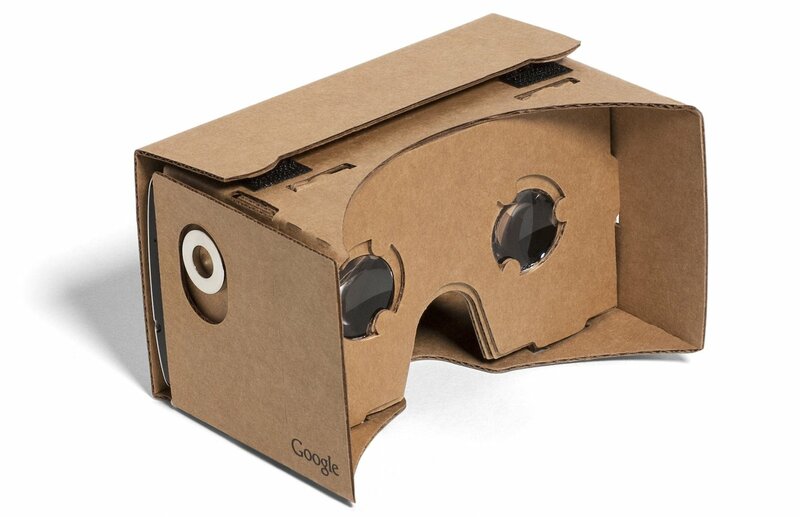 I’ve been disappointed that I haven’t found anywhere to share Google Cardboard photos. The camera itself doesn’t offer a photo sharing social network. And I haven’t found any despite a few hours of searching. The best possibility seems to be Google Street View. But that experience is a bit impersonal, aimed at locations rather than the intersection of people and locations. As a hiker, I love the idea of being able to bring the experience of Maryland Heights to others. I’m expecting that a social network for exploring the world in VR is right around the corner. And I’m looking forward to it. It’s going to offer a more intimate photo sharing experience than what’s available via Instagram and other 2D apps. The ability to feel that you are a part of the world someone else has captured is to step into their experiences, their memories, their world. Right now, there seems to be a few panorama photo sharing networks, like SphereShare.net but it lacks VR. And YouTube has some amazing VR videos. Seene lets you use Cardboard to see 3D images, but they are the result of an effect and not a fully immersive, 360 experience. Flickr has a VR app coming for Oculus (If a social VR photo app does exist and I’m just not finding it, let me know!) And vTime is supposedly going to be the first VR social network, where people can build virtual realities and travel those created by others. In the meantime, for fun, I thought I’d share a VR photo I took using Google Cardboard Camera during a hike to Maryland Heights, the famous overlook at the Harpers Ferry National Park near where I teach. If you want to view the photo in VR, you’ll need the Google Cardboard app on IOS or Android. Follow the simple instructions here to download it for viewing in your Google Cardboard Camera app. The photo was taken atop Maryland Heights in January, 2016. Across from you is historic Harpers Ferry, WV. Maryland heights is a famous hike in Maryland that is part of the Harpers Ferry National Park. The river between you and Harpers Ferry below is the Potomac River. The river to the south (to the left of Harpers Ferry) is the Shenandoah River. Virginia is on the other side of the Shenandoah River. So, in this photo you can see three states. This is the confluence of the two rivers and the river continues as the Potomac, the same river that Washington, D.C. is on many miles downstream. Enjoy! What are your thoughts and predictions for VR in 2016 and the years ahead? How will VR marry with social networking? Clearly, we are on the tip of the iceberg when it comes to VR. Finding great social media books to use as texts in a social media class can be a challenge. The space is constantly changing and there is so much we need to teach our students. Personally, I’m always looking. 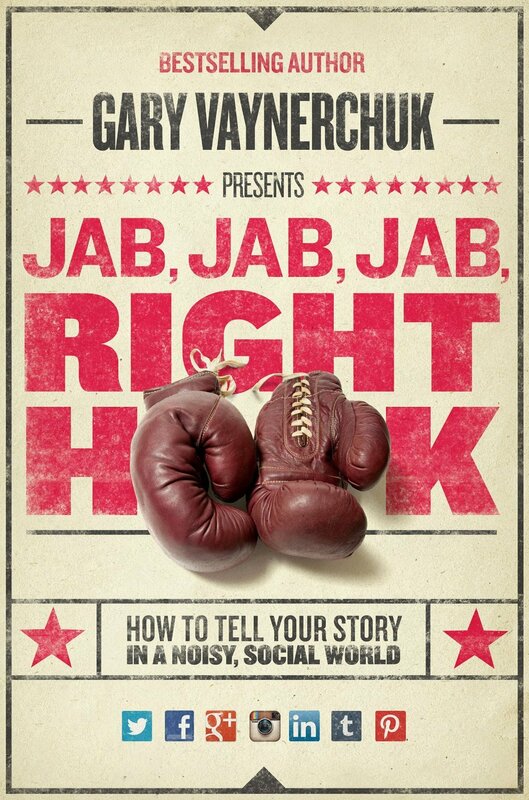 That’s why this summer I read Jab, Jab, Jab, Right Hook: How to Tell Your Story in a Noisy Social World by Gary Vaynerchuck. Here are 2 areas where the book excels. The jab in this case is your social content that does not aim to sell or promote a product. It is the content that builds the relationship with the audience. The basic premise of this book is that in order to hit your customer with a “right hook” to knock them down (i.e., get them to buy), you have to set them up with a lot of little jabs. It is these jabs – pieces of content that are native to the platform and speaks to the interests of your followers – that get them to pay attention to you. Gary’s argument, then, is that the reason most people get social media wrong is because they try to advertise on social media. 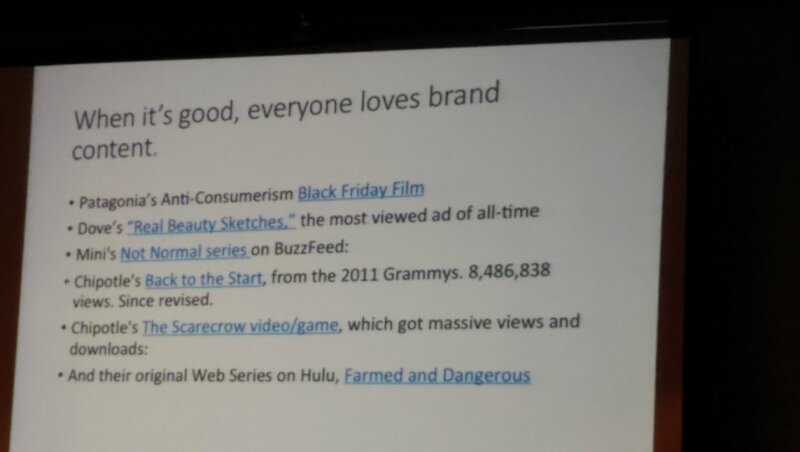 Since everyone hates being advertised to, people don’t pay attention. In other words, most people try to take old approaches from other mediums and apply them to social media. If, on the other hand, organizations provided value to their followers – via jabs – then their followers wouldn’t mind a little sales or promotional message – right hook – every once in a while. This is an important lesson we are all seeking to teach our students. I’ve often spoken about things like the “80 20” rule. The boxing analogy makes it tangible for the reader – and I think students will easily relate to this. So the question becomes, how do you create great jabs that customers are happy to take on the chin? It is this question that the book seeks to address. Vaynerchuck addresses this question with chapters on various social media channels with primary focus on Facebook, Tumblr, Twitter, Instagram, and Pinterest. At the end of each chapter is a long list of specific social media posts from various companies, big and small. Gary deconstructs each social media posting, which is published in full color so you can see it how it would be on the screen. He explains the pros and cons of the post for that social platform. Also, he provides specific insights on how to improve the post. 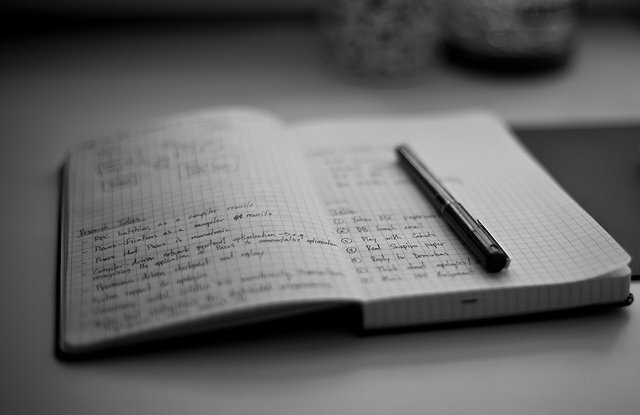 These detailed examples are great for anyone learning how to create better content. The advice is actionable and supporting reasoning is provided. I learned some great pointers from these sections of the book that I had not considered before. And I believe it has helped me create stronger content for myself. And, I’ve incorporated a few of his points into my lecture. These examples along make the book worth a read. They have a great potential to help students learn how to make better content. In other social media books I’ve read or browsed, I have found a dearth of specific, clear, helpful examples to support what the author is seeking to teach. This is where Gary really adds value to the reader. He takes the time to get into specifics on post after post so that the reader isn’t left with just sweeping claims of what to do. 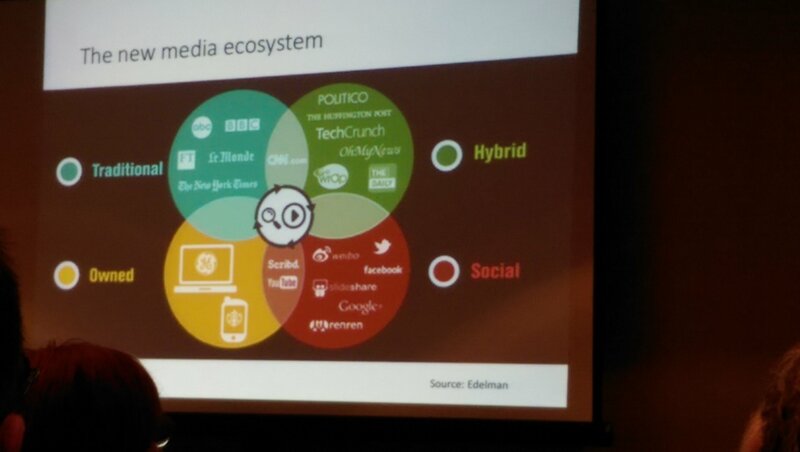 Most students understand how to make social content – since they create it and are around it all of the time. 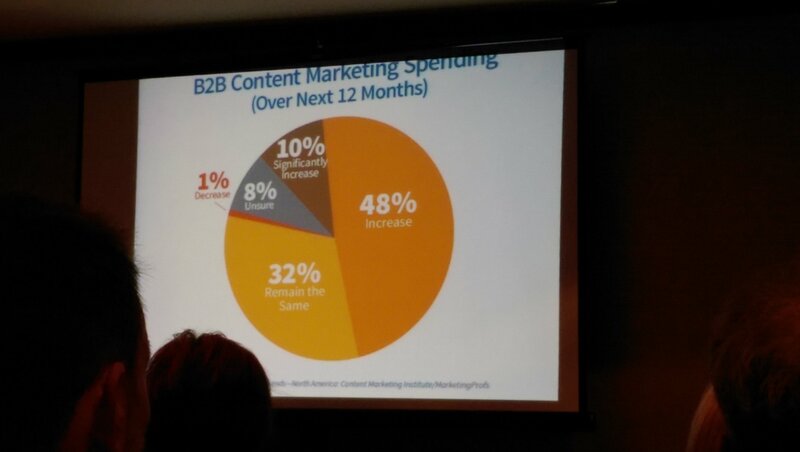 But my experience is that it can be very difficult to teach students how to make better content. I love this book for this reason! The Verdict: Would I Use This Book In My Social Media Class? In short, Yes. However, I didn’t adopt the book this semester. The biggest reason is that the due date for submitting our fall readings was during spring semester. I’ve always hated that policy though I understand the need for that much lead time. But, it tends to stifle my ability to find something new that I love and add it (When I’ve tried to throw a book on the syllabus as a required reading that wasn’t available in the bookstore in the past, students have not been too happy). So I added this book as a recommended read on my syllabus. Of note, Gary has a “I’m not going to sugar coat it for you” style that is a part of his brand. I mention this because it may not appeal to all readers. But, I can see a lot of students finding this style appealing as opposed to the more staid writing styles that prevail in most texts that make their way into the classroom. I would not use this book as a standalone. It doesn’t offer a lot in the areas of analytics, for example. It is a book on how to create content – as the title suggests. So, I would suggest coupling it with other books and readings. In short, Jab, Jab, Jab, Right Hook is a useful addition for its emphasis on the hows of creating great content and why the advice provided is effective. It is a worthwhile read for both students, professors, and practitioners. Likeable Social Media by Kerpen – this is a book I have used for several semesters and love. (there is an update version that I have not yet had time to read – the one linked here – that students have told me they really are enjoying). Your Brand, The Next Media Company by Brito – this book is a little more challenging of a read for some students. But it is a great book and my second time using it. What books do you use for your social media class? I’d love to know! Recently I had the opportunity to write a guest blog post on the Hootsuite blog about harnessing the social media mindset our Millennial students bring into the college class today. That post was published yesterday! 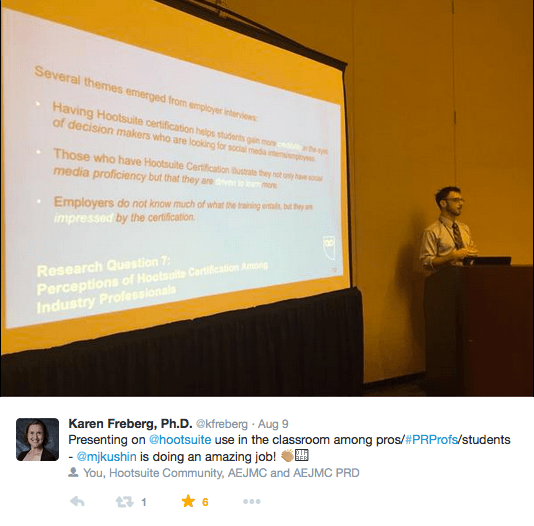 Here are two great things I love about Hootsuite and their higher ed program. 1) Dedication to Social Media Education and Professors: Thanks so much to the awesome people at Hootsuite for inviting me to write this post and for all the great support they’ve given social media educators. I know of no other company like Hootsuite that has done so much to support social media education in higher education. And I am very proud to have had the opportunity to write a post for such a great brand. 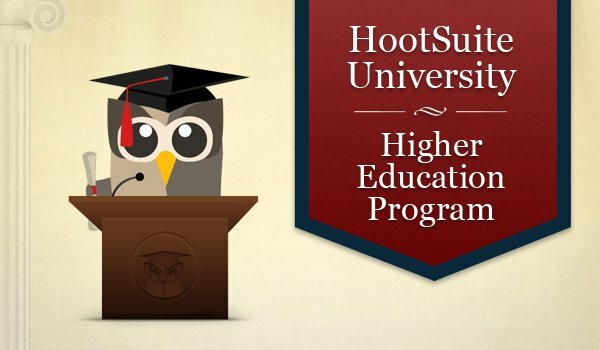 Hootsuite is a leader in helping give students free access to professional social media tools, and has shown a true dedication to supporting social media educators with the Hootsuite University Higher Education program – a free program available to university educators and their students. They continue to take steps that have demonstrated their dedication, including a free webinar this Thursday (August 21st) with tips from professors teaching social media. They also presented at AEJMC 2014. Unfortunately, I wasn’t able to attend because I had to present elsewhere. But the word is that it was a great presentation to a packed room. To learn social media, students need hands on experience with the tools they’ll be using in the field. Unfortunately, the high cost of many of these tools makes them inaccessible in many classrooms unless there is substantial funding. And in today’s educational environment, that is hard to come by. I truly wish more companies in the social media space would follow Hootsuite’s lead and provide access, training, and support to social media professors and our students. I’ve attended numerous conference sessions where I’ve heard these sentiments being expressed among new media educators. 2) Benefits of the Hootsuite Program – I began using Hootsuite University in my social media class last fall and loved it. Prior to that, my social media students were using Hootsuite for in class assignments but I wasn’t yet aware of Hootsuite University program. I’ll be using Hootsuite University again this year because it is truly an essential tool for the social media classroom. I say that because it offers not only access to a paid version of the Hootsuite dashboard – Hootsuite Pro – with advanced features that students can learn from hands on, but also a rich library of educational videos that really help students learn the professional use of social media. As I mentioned in my blog post on Hootsuite’s blog, while students today are digital natives they do greatly benefit from our help when it comes to moving from personal to professional use of social media. Hootsuite University also includes a number of video case studies professors can use in the classroom. Here are 3 Great Benefits of the Hootsuite University Higher Ed Program, a previous post I wrote about this great resource. I like to use the Hootsuite University videos as supplements to class lecture, activities, and assignments. All of my students are required to complete the certification exam, which includes with it a series of courses to be completed before taking the exam. They also must complete a few of the other course that I assign from Hootsuite University program as well as one course of their choosing. In the classroom, we use Hootsuite dashboard and the things students learn via the educational videos to complete in class activities and assignments. In this way, I bring what they’re learning in HU into the class – these are skills they must learn in HU and apply in class to succeed. I wrote about one such activity in the blog post on Hootsuite’s blog where students search brands using the Hootsuite dashboard. Last semester I also used a few video case studies in class and plan to use a few more this semester. If you’re not familiar with Hootsuite, they are the creators of an awesome social media dashboard that I’ve been using for years. The dashboard integrates Twitter, LinkedIn, Facebook, and other services and enables you to spread your lists into columns for easy viewing. It also offers some powerful tools like scheduling posts, auto scheduling, and Klout search. If you have anymore questions about my thoughts or experiences with Hootsuite, drop a comment or contact me via Twitter. Note: Hootsuite and the Hootsuite logo are copyright Hootsuite Media. If you are a lover of Google Scholar like me (I’ve written a few posts on becoming a G Scholar power user, in case you’ve missed them) you may have seen that the 2014 Google Scholar Metrics are out. So how is it ranked? According to their site, Google uses h5 scores for h-index and h-medians. An h-index is described on the Google Scholar Metrics page as: “the largest number h such that at least h articles in that publication were cited at least h times each. For example, a publication with five articles cited by, respectively, 17, 9, 6, 3, and 2, has the h-index of 3.” They describe an h-median score as “the median of the citation counts in its h-core. For example, the h-median of the publication above is 9. The h-median is a measure of the distribution of citations to the articles in the h-core.” The h5, what they use, is that score for only articles published in the last 5 complete calendar years. What’s covered in 2014’s list? 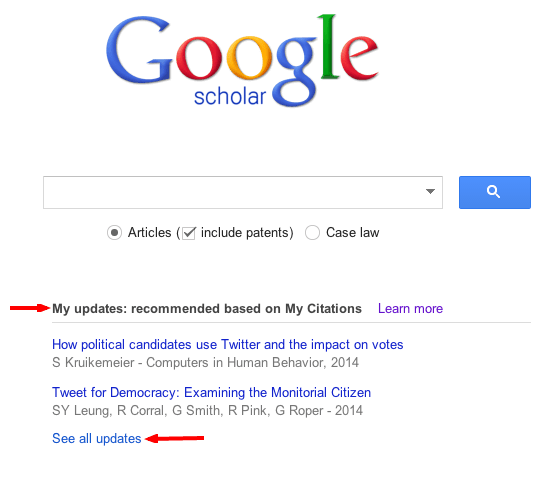 Articles published between 2009 and 2013, indexed in Google Scholar in June 2014. Here’s more detail on what is included. There you have it. According to Google’s ranking system (that is, based on citation numbers as described above), those are the top journals in Comm. You can see all the different fields, browse, and search the Google Scholar Metric here. For more information on G Scholar Metrics, here’s a release on the Google Scholar blog. I’m not here to comment on whether the study was ethical or not (certainly it wouldn’t have passed any IRB I’ve ever heard of). No matter your opinion, this case brings up a very interesting situation that will make for a great discussion opportunity in a research class when it comes time to talk ethics and IRB. And what better way to find out than through social scientific study? Facebook has the access and clearly the ability through their algorithm to manipulate what you see. The fact that they are doing this doesn’t surprise me (They manipulate users’ news feeds in an attempt to optimize their service). And the anxiety and controversy it is causing doesn’t surprise me (It brings questions to the mind of many: How else are they manipulating me? And that breeds distrust). What I find interesting is that they make public their work and used it to contribute to scientific understanding. And, in a way, I’m glad they did because it creates teaching and learning opportunities for all of us. Great Discussion Topic For Class #1: Informed Consent: What is it? What consists of consent? And did users consent in this case? And what are the ramifications of not having informed consent? I tell my students Informed Consent means exactly that. You are INFORMED as to what the study is about and you CONSENT to participate. There was no overt informed consent. No one actively stated their agreement to participate in the study, and they were not informed about the study and what it entailed. The obvious argument is that Facebook should have disclosed this information. From a professional communication perspective, this works. Clear. Transparent. Don’t violate the trust of your users. If Facebook was concerned that negative content might lead people to avoid visiting Facebook, was their answer to enlist users in an experiment without their consent? Which is more likely to keep people from visiting Facebook? I always tell my students that one of the ramifications for unethical or deceptive scholarly research is the threat to public trust of scholarship and scholarly institutions. The public has long heard about the Milgram studies and other ethically dubious research. And they’re nervous to participate in academic research for those reasons. People don’t like to be duped and the common perception is that scholarly research involves deception or trickery – that some hidden hand is manipulating them in an uneven interaction where the researcher is supposed to be blindly trusted. And this case with Facebook may produce the same wariness among the public psyche as those famous studies we all learn about in school. Indeed, it seems more and more people are concerned about privacy and what they’re giving up about their lives for gain of free services (e.g., concerns about Google and its Google Glass). Now, Facebook argues that your consent to participate is implied as a result of agreement to the Facebook terms of service. And it can be argued that if people knew they were being manipulated then the Hawthorne Effect would likely take place. And thus the experiment would have not been effective – thus, in the eyes of some, justifying the use of deception. I’m sure that asking my students next time I teach communication research class: “What if you were one of the participants? How would you feel?” will produce a lively response. I’ll be sure to remind them that it is possible they were and they’ll never know it. I’m interested to know their informed opinion after we discuss these topics: What responsibility does Facebook have to disclose this information? Great Discussion Topic For Class #2: IRB – what is it? Why is it important? And what needs to be reviewed and what can be exempted? Who is responsible for reviewing a study such as this and making sure it passes appropriate guidelines to ensure participant rights are considered and protected? Of course, at a university we have the Institutional Review Board. We’ve all dealt with them at one time or another. But when a corporation does a study, shouldn’t that also fall under review of a governing board? Interestingly, this study was done in part with researchers at Cornell. And a quick read of this Washington Post article gives the casual reader the impression that Cornell IRB reviewed and approved this research. However, you’ll note that it states that they approved the use of pre-existing data from Facebook. And that is something many of us have used in conducting our research on Facebook or Twitter. Simply, the data already exists and we’re going to analyze it. But that wasn’t the case in this study, really. Facebook conducted the experiment and now researchers from Cornell were going to analyze it. It seems there may have been some confusion about the fact that Facebook conducted the experiment. And clearly there was some confusion in how the media reported this / or how the public was interpreting it. Because that article was updated to note that Cornell did not approve manipulation in the study. 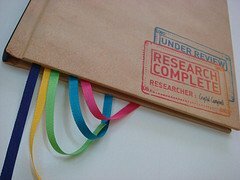 And a follow up article discusses that Cornell’s IRB has made effort to clarify that the study was conducted prior to Cornell’s IRB was consulted. Because it may seem confusing to someone not familiar with the distinction between conducting an experiment and using pre-existing data, it is a great opportunity to explicate this distinction to students and help them understand the notion of pre-existing data and public data and what can be exempt and what can’t be (and that even if something is going to be exempt, it still needs to go through IRB!). Altogether, I’m sure this will really help students see why IRBs are in place, the importance of their role, and while it is a lot of work to go through the process, why it is important for ensuring public safety and trust. What do you think? Was the study ethical? What other articles or questions would make for a great class discussion on this subject?